IRRI and Laos signed and put the research partnership in motion on May 8th. 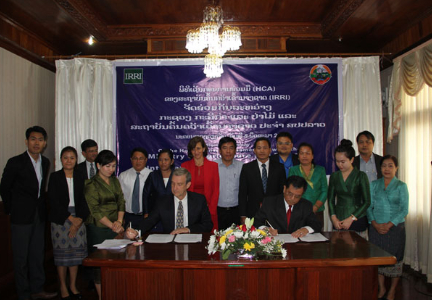 VIENTIANE, LAOS — The International Rice Research Institute (IRRI) and Laos have an increased their role in the country’s food and nutrition security with a new partnership in research. The agreement will enable continued conduct of scientific work that will contribute significantly to the development of the country’s rice sector. Collaboration between Laos and IRRI—formalized in 1987 when the first memorandum of agreement was signed between the two parties and intensified in the 1990s—resulted in the transformation of Laos rice sector from purely subsistence levels to commercial production. In 1999, the country achieved rice-self-sufficiency with a total rice production of more than 2 million tonnes. In 2012 and 2013, rice production exceeded 3 million tonnes, according to the Food and Agriculture Organization of the United Nations (FAO). Current collaborative projects with Laos include the Consortium for Unfavorable Rice Environments (CURE), which seeks to enable farmers in the most challenging environments, such as rainfed areas, to improve their livelihoods by introducing climate-ready technologies. CURE also operates in other parts of Asia such as Bangladesh, India, Nepal, Cambodia, Indonesia, Philippines, Thailand, and Myanmar.